Friede is the eldest sister of the Sable Church of Londor. A player needs to pull the crank in the pit with the flies to open a passage to the boss fight. If you are pursuing the Lord of Hollows ending she has dialogue pertaining to Yuria of Londor & your role as lord. In an underground chamber near the Ariandel Chapel bonfire, in the Painted World of Ariandel. Slave Knight Gael: his summon sign is in the corner to the left of the room near the stairs. He can be summoned even if not embered. He will appear at the beginning of the second phase. If you are far away, she will leap at you and smash down, creating ice in an area in front of her. This attack offers a guaranteed chance to punish since it takes her a few seconds to recover. Dodge around her to avoid the ice, then quickly run up to her for a backstab. Just watch out for the ice burst. Closer, she will perform a spinning slash that hits twice. If you are far away and she hops toward you while holding the stance, it means she wants to do this attack. If you keep backing away, she might hop toward you several times consecutively because she really wants to hit you with this. If you run out of room to back away, try to roll toward her to either side as she swings. The "impale" attack in which she flings you into the air then drags you down with the scythe. This attack cannot be blocked. If you are far away, she will grind the blade along the ground for a distance. This is a chance to interrupt her with your attacks. At close range, however, this attack has a fair chance of catching you by surprise, since she will skip the entire "blade-grinding" part, and swing at you immediately instead. The stealth attack can be quite troublesome until you figure out how to counter it. The specks of ice that rise up will tell you where she jumps to. If they look like a vertical column then she is jumping to a spot directly behind you. If the clusters of ice flow toward the left, then she is moving to the right, and vice versa. You can also counter her stealth by hitting her with arrows or throwing knives. The arrows and knives on her body will not become invisible. Another trick that also works is marking her with the Soldering Iron. Either way, getting close to her will remove her invisibility. Once you know what to do, this attack becomes a free backstab opportunity (or whatever you plan to do when she is telegraphing the attack). She employs this attack frequently enough, you can totally just wait for this attack the whole fight and backstab her until the next phase. Another attack that can be punished easily is the one in which she makes two basic attacks, leaps backward, creating ice on the ground as she lands, then immediately leaps back at you to smash down. This attack does not have much tracking. As she jumps backward, just move forward a few steps, and she will land behind you after the smash. You can then turn around and, if you are close enough, land a backstab. After a while, as you get used to Friede's basic combos, you will be able to weave in and out of her range and counterattack without much trouble. You can also certainly try to parry her, but most likely you will only get a partial. Considering how often she can be backstabbed, being a backstab fisher definitely beats trying to be parry king here. This phase is quite straightforward, and is more or less a test of patience and cautiousness. Both of the bosses do not have a lot of variations or combos in their patterns. Friede becomes much more passive than previously. She is slower to react if you run up to her for melee attacks. If you keep your distance, she will simply keep blasting the ice wave at you. Once their health drops to about 70%, Friede will attempt to heal them both from time to time. If you see her enter stealth mode, be ready to run at her for a backstab when she shows up. The spell takes a very long time to complete, but it heals for a lot of damage. The healing is usually accompanied by the fire breath attack from Ariandel. Sometimes though, it might not be worth the risk to try to backstab Friede, as you might not be able to dodge Ariandel's incoming attack when you finish the backstab animation. At certain times you are better off sticking to Ariandel for free hits while Friede is busy healing. There will be a lot of running back and forth and around the room if you play melee. Strong ranged attacks will help a lot in shortening this phase. If you make a ranged attack from far away, Friede will close in on you - she can make a huge leap to cross half the room and land behind you. However, when you are within a certain range - not too far, but not close enough to trigger her melee attacks - she becomes very passive and will not dodge like she would in the first phase, allowing you to easily land ranged attacks on her. This phase could actually become much more toilsome if you play pure melee. Something to keep in mind before trying to land melee hits on Ariandel, is that Friede frequently stays hidden behind/under Ariandel, so when you approach Ariandel, you also enter Friede's range, and she will jump out of nowhere to hit you. Although Ariandel is easy to dodge and punish for the most part, he does have a couple of fairly quick smashes prepared to catch you mid-attacks, as well as a huge explosive smash. After his charge, it is best to watch him for a bit to make sure he is not doing a quick smash, hit him a couple times, save some stamina, then back away and watch for the bosses' next move. Ariandel can be poise-broken for a critical attack. The grand finale. 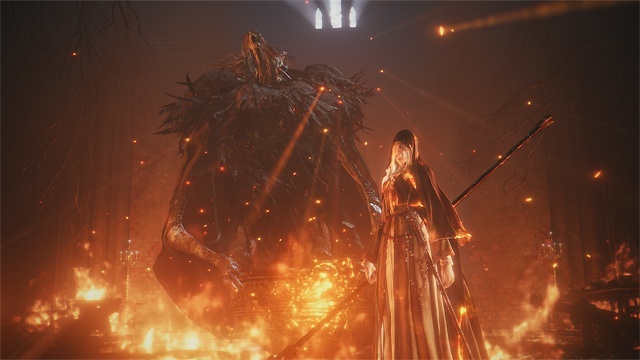 Friede becomes empowered with black flame and her style is much different, since she is now essentially dual-wielding a pair of scythes. She can chain basic attacks with the scythes into long combos that have fair step-in distances. If you are caught within range, there is no backing out of her combos. Her swings cover wide arcs, and they alternate between fast and slow, so dodging in melee range is not exactly easy. Keeping a very good distance all the time and focusing on dodging are really the best moves, since her scythes can damage you through your shield, and also, staying far away from Friede encourages her to perform one of the "special" attacks that can be turned into a backstab opportunity, as detailed below. The leaping attack from the first phase. She assumes stance then leaps at you and smashes down. She needs a moment to recover and will not dodge right away. The ice mostly forms in front of her, so just dodge to behind her then turn around for a backstab. The attack in which her magic scythe glows while she crouches down, before dashing toward you. If she catches you with this attack, she will "execute" you by slashing your throat from behind with both scythes. Dodge toward/into her before her scythe connects, then she should be right next to you when you stand back up. This is usually an easy backstab chance. The blackflame smash. After the initial explosion when she lands, dodge the streak of black flame that runs toward you, then quickly run toward her for a running attack. Or, if you are not too far away, run toward her when she is in the air so that you are behind her when she lands. You will be safe from the explosion. You can then move in for a backstab. The ice smash - the equivalent of the blackflame smash. She jumps up while spinning, and ice forms twisting lines around her. She will then smash down, creating an area of ice in front of her. Exactly like with the blackflame smash, try to get behind her before she lands and you can get an easy backstab. The stealth ranged attacks. She becomes invisible, jumps away, then performs the ranged ice slash - the attack from the second phase, but now with some tracking to it. She does this twice, then jumps away again and prepares for a blackflame wave slash. Just like in the first phase, the specks of ice will let you know where she dashes off to. After her third jump, get close to her to cancel her invisibility, then when she is preparing the blackflame slash, get behind her for a backstab. By weaving in and out of range, you can bait out the entire 7-hit combo which ends with her leaping forward and smashing down. Just before she smashes down, roll toward/into her. With a well-aimed roll, you can land a backstab before she can hop away. Most of her other attacks can be parried, but again, you are better off waiting for a backstab chance instead. There is a bug/oversight in Friede's behavior during the first phase. When she is charging up the stealth attack, if you hit her with an arrow (or bolt), you will stagger her and thus prevent her from performing the attack. Instead of changing her action, however, she will just keep trying to perform the stealth attack over and over. If you land only one shot at a time and stay outside melee range, you can maintain this loop for about 30 seconds, because apparently her AI instructs her to enter stealth every 30 seconds or so. Therefore, at the end of this duration, she will fall back, simply to enter stealth again and repeat the cycle. If you use a greatbow, you will knock her down, and this will reset her behavior to normal. Hitting her with a kukri also staggers her, but it would seem this counts as any melee attack as far as this issue is concerned, and she will continue as normal. The Titanite Slab will only drop the first time you defeat phase 2.